You can never, ever go wrong with the classics. I call “Knorr Spinach Dip” a “Classic” because it has stood the test of time. It has been around for years and years with good reason. It’s delicious, impressive and everyone loves it. 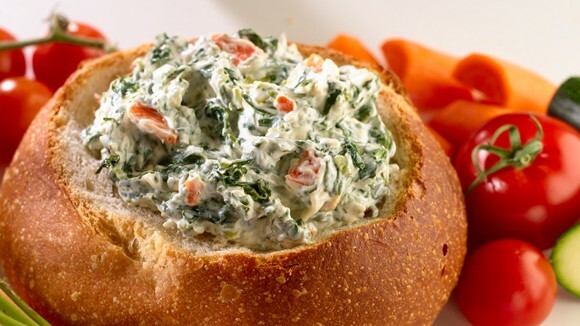 We like to serve this classic spinach dip in a bread bowl with large chunks of rye, pumpernickel, hearty sourdough or beer bread. Spinach Dip has been a holiday dip for generations. I can’t remember a time when I didn’t see this classic on the holiday buffet table. I was a younger, way back in the day when Knorr only made a handful of products, vegetable recipe mix/dip was one of them. This recipe is the same recipe that can still be found on the back of the package of vegetable mix. Knorr spinach dip, Lipton’s french onion dip and the ever popular cheese and sausage tray, have long been standard or classic fare on holiday buffet tables everywhere. This recipe can’t get any easier. Made with frozen chopped spinach, sour cream, mayonnaise, Knorr vegetable mix, water chestnuts and sliced green onions. That list just sounds good, doesn’t it! Spinach Dip can be made ahead of time, making it convenient too. Remember to squeeze all of the water from the spinach. This will ensure that your dip doesn’t become watery, hence ruining the dip. After all, no one wants to eat a watery mess. A classic recipe everyone has loved for years. Serve with an assortment of veggies, crackers, bread and/or dippers of your choice. Looking for more dip recipes to serve over the holidays? Here is a collection of some of our favorites. Dip into Delectable Dips. If you can’t find a dip recipe you like from our favorites collection, shame on you:), you can never go wrong with 80’s Poolside Bean Dip.